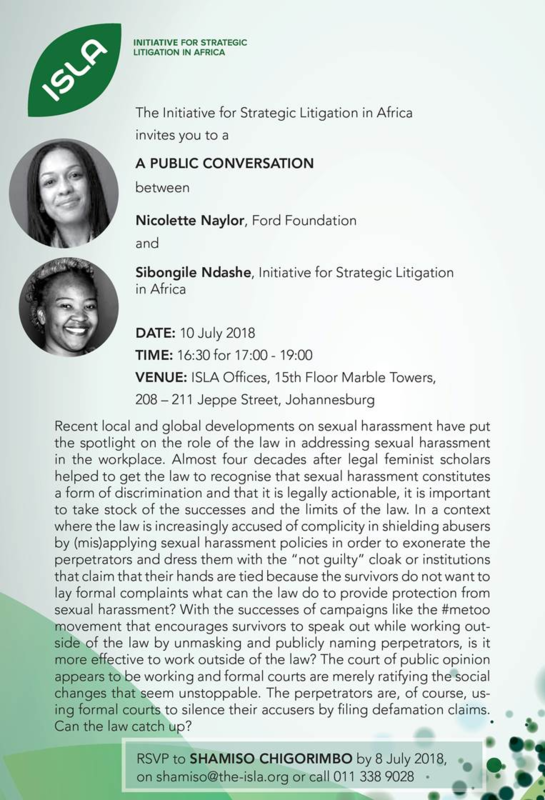 The Centre for Law and Society hosted a live-stream of the conversation between Nicolette Naylor and Sibongile Ndashe (see details below) for Western Cape colleagues who are unable to travel to Johannesburg. The Centre for Law and Society and the Equal Education Law Centre hosted part two of a conversation between Nicolette Naylor (Ford Foundation) and Sibongile Ndashe (Initiative for Strategic Litigation in Africa) on 13 September 2018. Listen as they build on a conversation on Sexual harassment in the work place and touch on strategising on how we can use the law to address sexual harassment. Does the Law Support Activism? - Wednesday 23rd May 2018 Mandi Mudarikwa (Legal Resources Centre), Bronwyn Pithey (Women Legal Centre) and activists from the Social Justice Coalition in conversation. Defining Intellectual Spaces - Wednesday, 10 October Is UCT a Pan-African university in South Africa or a South African university that caters to Africa? CLS will be hosted a Law and Society in Africa seminar on Wednesday the 10th of October. Listen to the discussion on defining intellectual spaces in the face of ongoing calls to restructure academic spaces and bring in new voices and approaches to addressing socio-legal issues.